Disclaimer: Ian has requested that I mention the fact that he has very successfully navigated to the summits of several munros in his life. In fact, every one we have climbed together, bar Ben Avon, which is obviously ‘cursed’. Ian and I arrive at the car park with out mountain bikes, sometime in March. Ian and I look around at other walkers who are wearing a gajillion layers, and are equipped with such extravagances as walking sticks and gloves. Ian and I (in lycra running shorts and a long sleeved top) both agree that these people are amateurs and that we are far superior (and badass) hill walkers, and smugly set off on our way. After an arduous 5 mile cycle, an enormous snow drift blocks our path before we even begin our main ascent on foot. We scramble to higher ground only to realize the entire munro is hidden under snow. It is very windy. I am very cold. We meet some walkers who inform us that they checked the mountain weather forecast before they chose their outfits, and they did not seem surprised when we told them we did not do the same. Ian gets annoyed that I am unwilling to risk hypothermia/death by continuing, I cry and shiver. We turn back, stopping only to locate the Secret Howff that we didn’t manage to find last time. Unwilling to face failure a third time, and determined to get this over and done with, Ian checked the forecast and took a day off work when the weather looked like it would be on our side. We left early, arriving at the car park at about 10, and setting off for the first 5 miles on the gradual ascent on our mountain bikes. We both commented on how much less efficient they felt than our road bikes, which have been getting a lot of use this summer thanks to an atypically glorious Scottish summer (featuring special guests, Sun and Warmth). In fact, the mountain bike section was a lot less crappy than I remembered it to be. Hopefully this is a reflection of my quad strength. Once it became a bit too life-threatening to continue by bike (at least for me), we locked them together near a burn (American translation: stream), and continued on foot. We followed the path that I had wanted to follow the first time we tried (and failed) to reach the summit. Ian, however, had decided to abandon the path and climb the steep edge of the mountain as his map reading skills led him to believe that the path would be the wrong course to take. In case you missed what happened previously, the path would have absolutely been the correct course to take, an opinion I strongly voiced at the time, and for several weeks afterwards, when we checked my Garmin details to confirm where we were. I am smug that I was right about the path. Eventually, we came to a T-junction in the path as we reached some very steep cliffs. To the right, a steep ascent close to the cliff face. To the left, a steep ascent close to the cliff face. At this point, we realized that we must have had the wind to our backs the whole time, because once we had stopped it felt like we were in a wind tunnel. “Left or right?” I asked Ian. “You sure? The summit definitely isn’t to the right?” I asked, because, you know, I wanted confirmation. “Yes. We’re definitely going left.” I sensed a little hostility from Ian after questioning his judgement. Left we went, climbing the very steep section where the path kind of disappeared, eventually making it onto the flatter section leading up to a summit. I looked behind us, mainly to marvel at how steep the ascent was, and told Ian that I was glad we were doing a loop, because I didn’t think I’d be able to go back down because I’m such a wimp with heights and descending steep bits. Especially next to cliffs with very, very, very high drops. 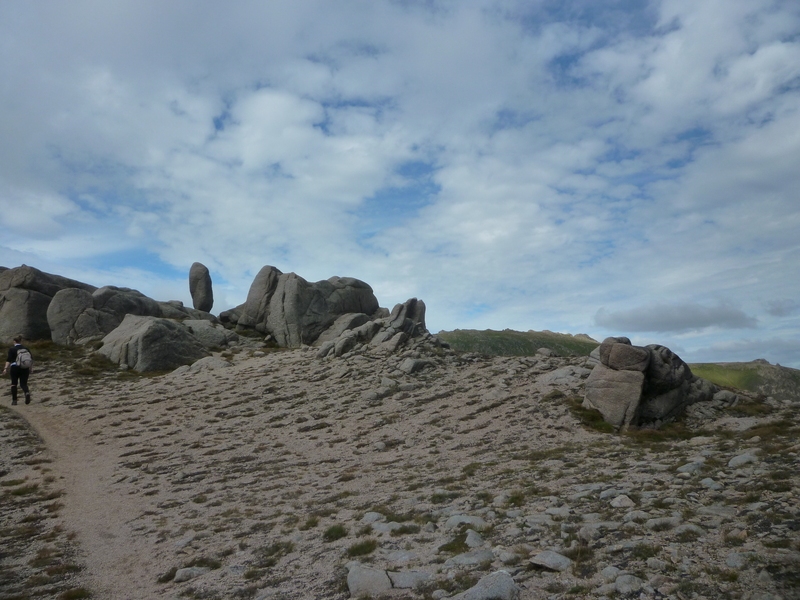 I then looked across to where the path to the right would have led, and noticed a very high summit. “You’re absolutely sure that’s not the top of Ben Avon, right?” I cautiously inquired. This was met by a frustrated confirmation that we were indeed on the right path. About 10 minutes of steady climbing later, we were at the top, where we took a couple of photos and shared a pack of fig rolls (American translation: Fig Newtons). As if you couldn’t see this coming, we were not at the summit of this shitting mountain. And yes, in order to reach the summit, we’d have to double back. 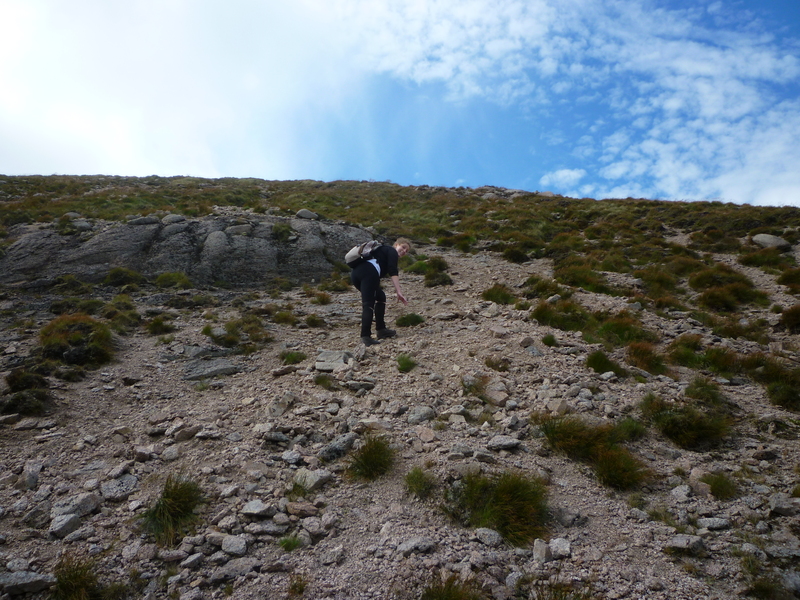 Before that, however, we decided to bag another summit which was a few kilometers away along a ridge, with very little extra climbing, so off we set for Beinn a’Bhuird (I have no idea how to pronounce that, so if you want to find out, go here). I was obviously super happy that instead of a gentle downhill walk back to the bikes like we had planned, we were only halfway through the scary cliff part of the day. 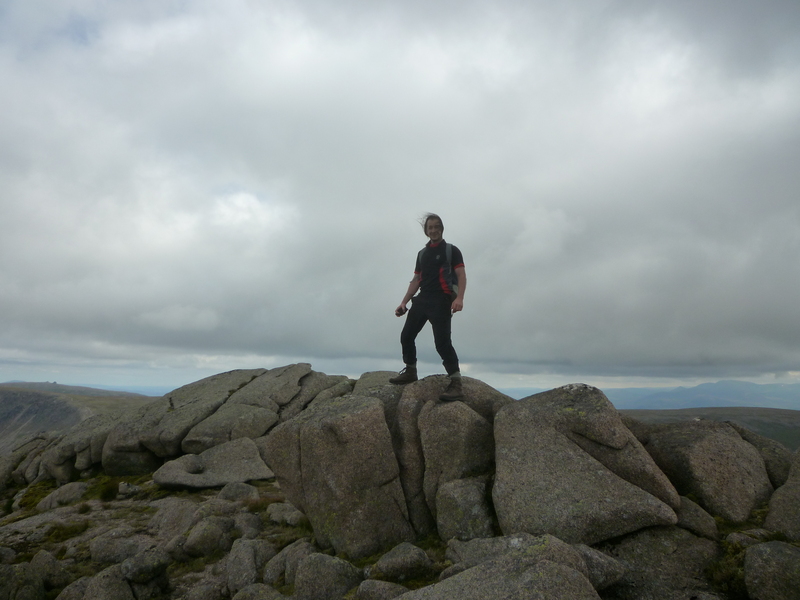 At the summit of Beinn a’Bhuird, with the summit of Ben Avon (the highest one in the distance) behind me. 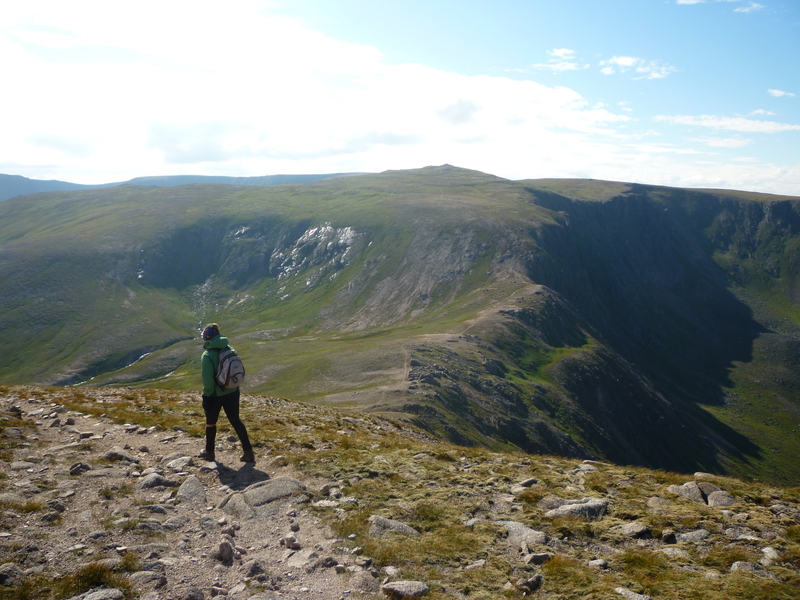 After a couple of photos, we retraced our steps and headed towards the summit of Ben Avon. Again. Going down the steep bit was terrifying, and I made Ian walk in front of me in case I lost my footing – a human shield, if you will. Finally, we were back at the junction, and then we started a long, steady ascent. Again. This side wasn’t quite as steep, but it went on for longer, before flattening out a bit with a clear path to the tors at the top. 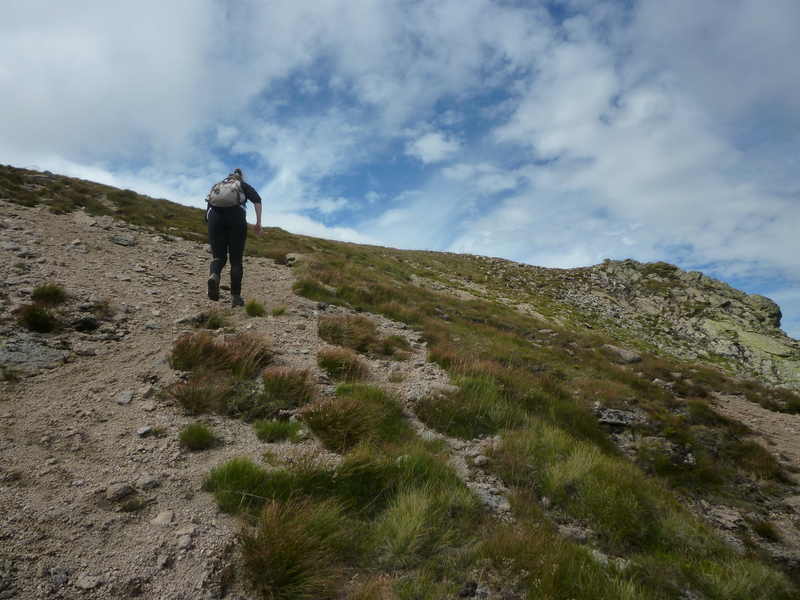 After the steep bit, approaching the summit of Ben Avon. 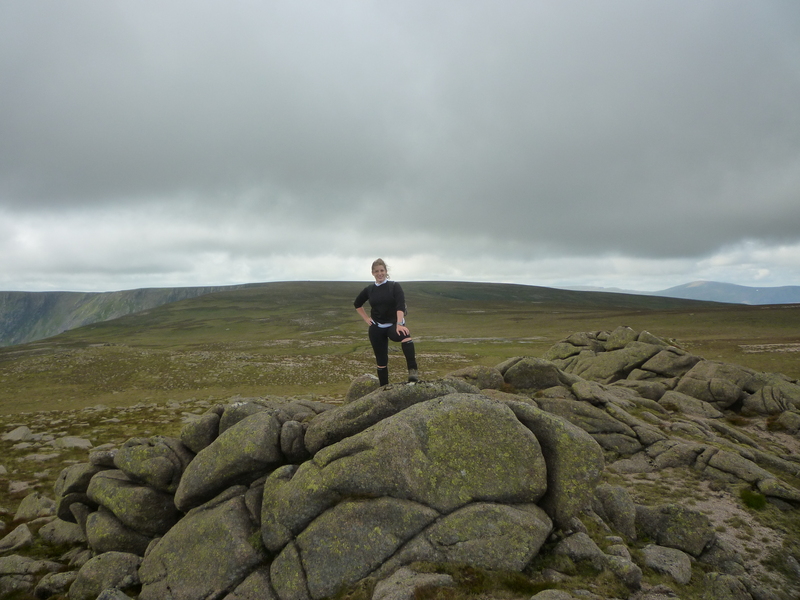 Finally, several hours after beginning our journey, we made it to the summit, where Ian forced me to climb on top of the tors for the official ‘summit photo’. I am not standing because there was a very real risk of being blown off the mountain (you may think I’m exaggerating, but I’ve witnessed a kid blown off his feet before, and yes, it was hilarious). 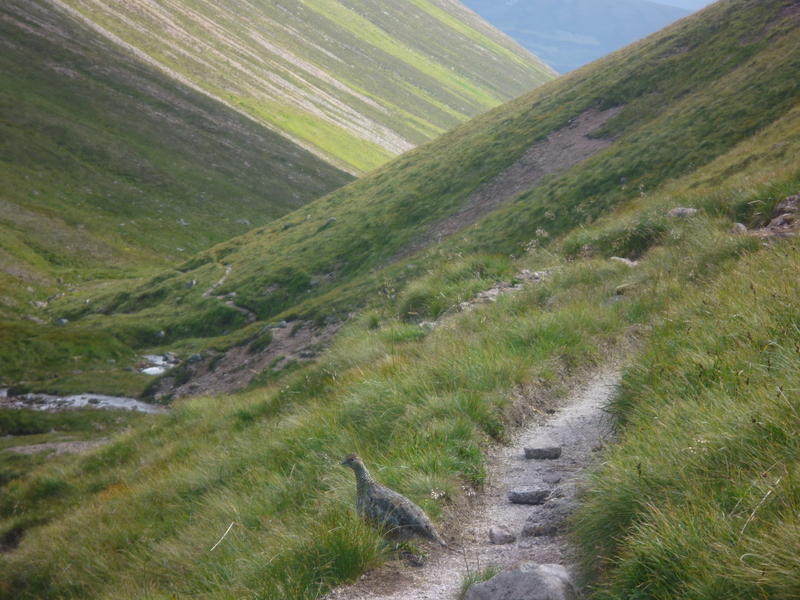 We shared our second packet of fig rolls, and started our descent, running into a few ptarmigans on our way. Heading back, with the false summit just to my right. Despite being behind schedule, we had decided to go a little bit out of our way to go to the Secret Howff again. 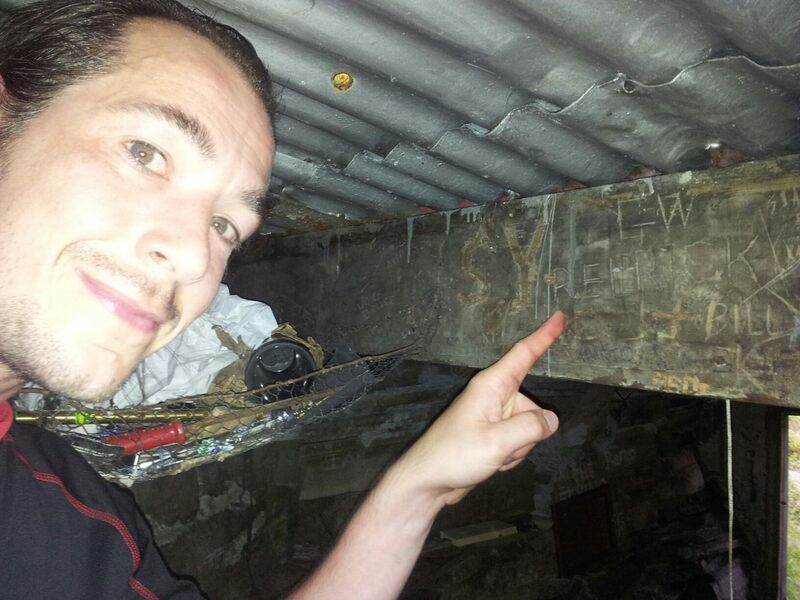 Ian’s late father and one of his friends had helped to repair it many years ago, and Ian’s brother had told us recently that he had carved his name into one of the wooden beams in the 60’s. Obviously, since we had missed this the first time we went, Ian wanted to go back and see if he could find the name. We signed the guestbook again, and then hopped back onto our bikes for the luxuriously (mostly) downhill section to the parking lot. Today, my first day back at school, was a bit of a shock to the system. 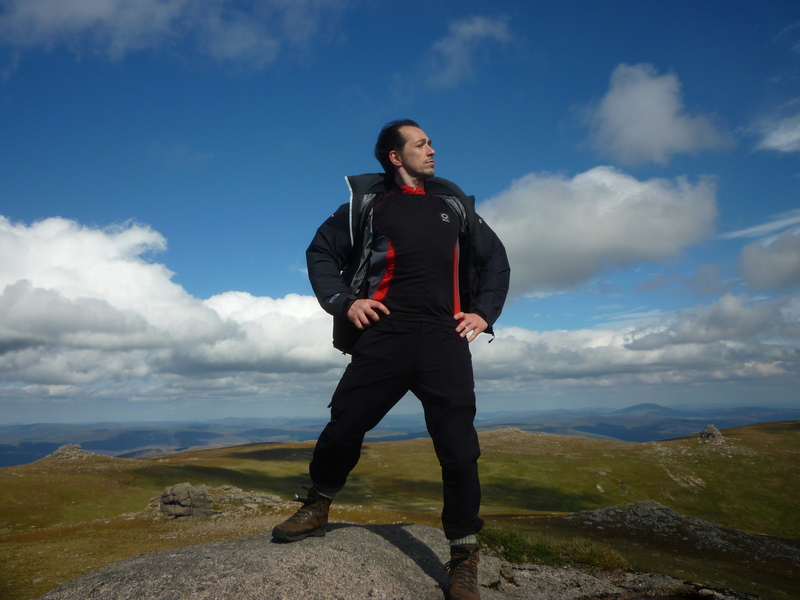 This entry was posted in aberdeen, Travel and tagged Beinn a'Bhuird, ben avon, cairngorms, munro, Scotland, Secret Howff by MedalSlut. Bookmark the permalink. Very good MS, thank goodness you succeeded on the third attempt. Love the Secret Howff! The photos look amazing. I am so confused by your gloves though. They make you look like you have alien hands. Can you explain the 3 fingers? They’re called Swix Split Mitts and they’re like a cross between mittens and gloves – it’s meant to keep you warmer than conventional gloves without “compromising dexterity”, apparently. I get really cold hands, so I wanted something that keeps them toasty – and these always do. Glad to read that you made it to the top, eventually. There’s always a hill that’s determined to beat you, one way or another. Mine was Ben Vorlich (Loch Lomond). First attempt – car broke down before I got there and my dad had to come tow me home. Second attempt – got 75% of the way up, looked at nasty clouds rolling in from the West and tuned around (a good call as 10mins after getting back to the car I was driving through a blizzard). 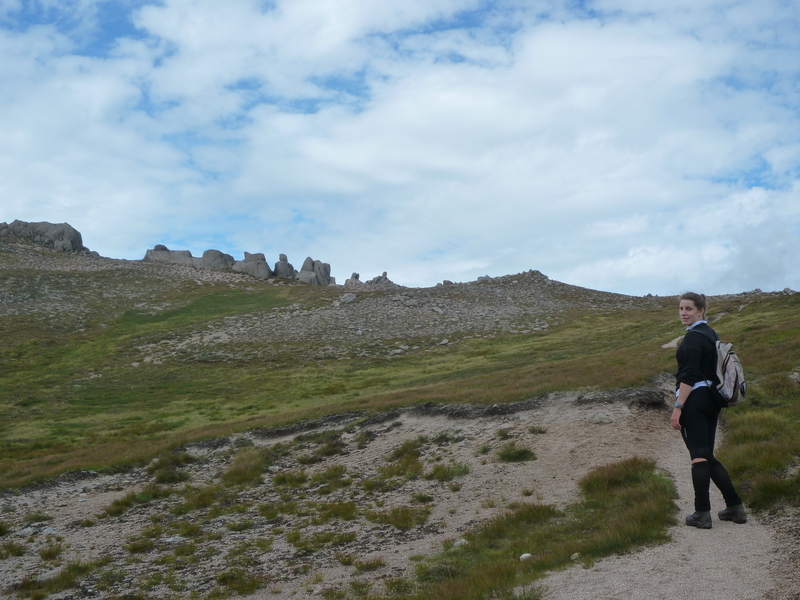 Third attempt – Made it to the top but the hill wasn’t done with me quite yet! I slipped on the way down, bashed my knee off a solitary rock and had to hobble the last 15mins back to the car. It’s not on my list for a re-ascent! – Buy Ian a mapping GPS for his next Birthday. One he can download the route into before you set off. Either that or you take over the navigation (not necessarily recommended as it’s a challenge to his natural position in the world as a bloke). – Caringorm footpath drainage ditches are evil! Most of them can be ridden though with a little practice, but if you hesitate they’ll eat you alive. – Carry a spare inner tube (or two) when that far out with the bike. Much quicker just to change a tube rather than having to repair one (that can be done at home later). – In addition to the point above, get some ‘scabs’. No, not the type you get when falling off the bike due to drainage ditches. They are patches for repairing inner tubes that just stick on and require less faffing around with glue. 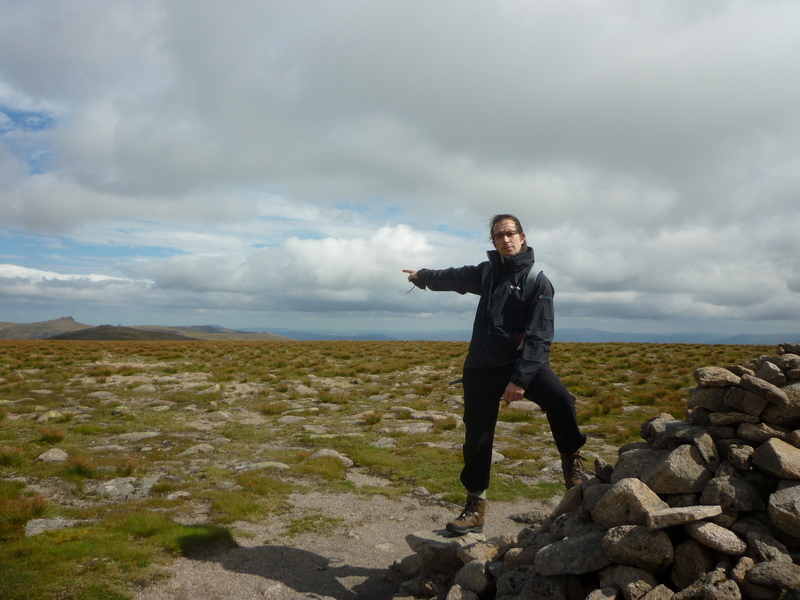 – Hillwalking can be enjoyable, really, honest. 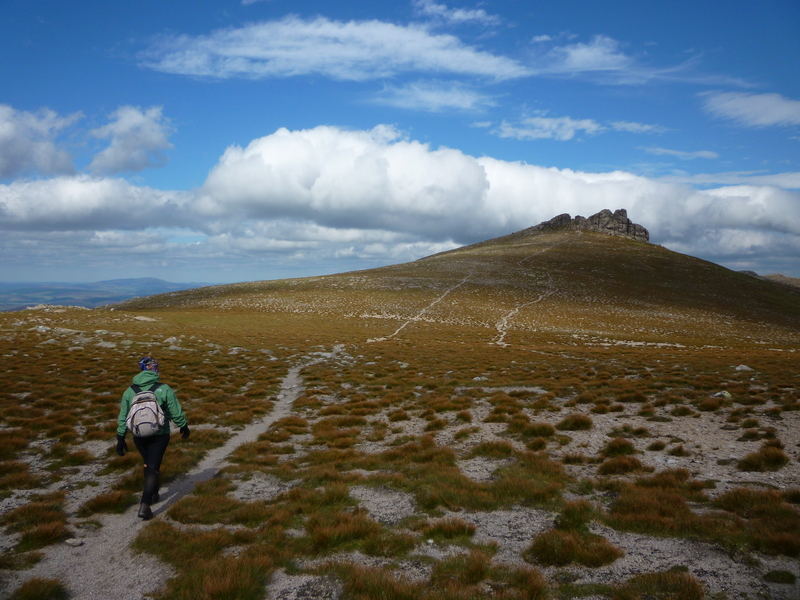 As for my attempt on the same two Munros a couple of years ago….I didn’t dare even crawl onto the top of the tor on Ben Avon as the wind was that strong a 13.5stone lump of meat would have been deposited back in the valley rather sharpish (weather forecast was waaay out in that respect that day). After continuing to Beinn a’Bhuird I’d to navigate using my GPS as the cloud had come down and I could see nothing more than a few feet in front. 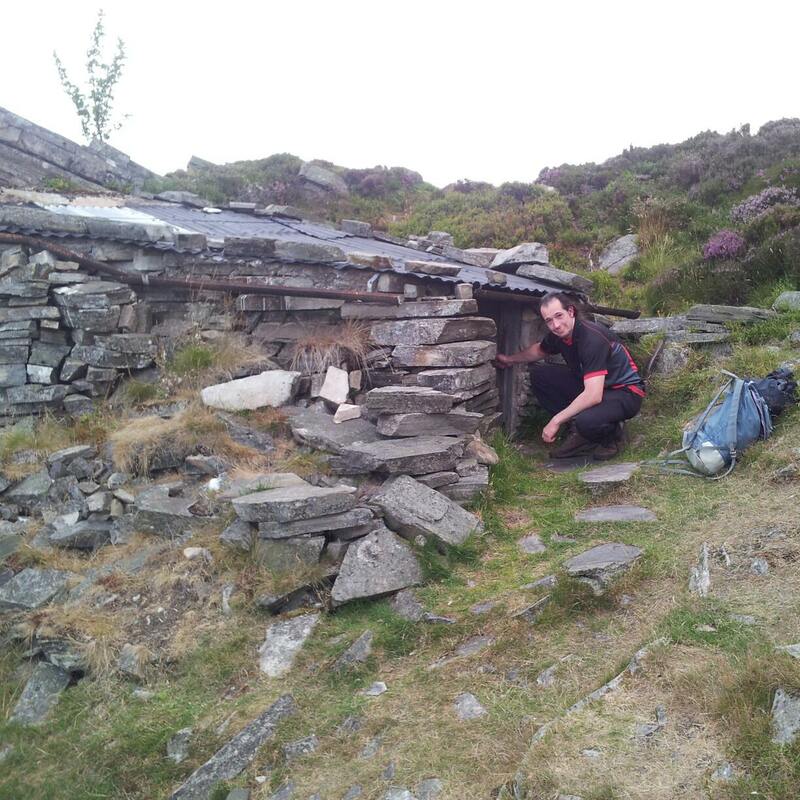 Hmmm…did I really try to claim hill walking can be enjoyable? Great blog by the way. I came across it when reading some running forums. I doubt many people could make reading about someone else running quite so interesting. I’ve been hooked on reading of your exploits, especially since I live in the same area. It gives me an idea of what events there are around locally. If I can motivate myself to do some more 10Ks (just Baker Hughes in 2010, Balmoral in 2012 & 2013 so far), or god forbid even a half marathon, I’ll try to say hi if I’m not a wheezing wreck at the time. Ha ha, thanks. Balmoral is a killer, but once you’re at the top of the hill, you’ve pretty much conquered the beast. 🙂 Garioch 10k is another local one you could tick off your list. It’s undulating, but nowhere near Balmoral status. And I actually bought Ian a GPS for his bike last Christmas – turning it on is what told us we weren’t where he thought we were! 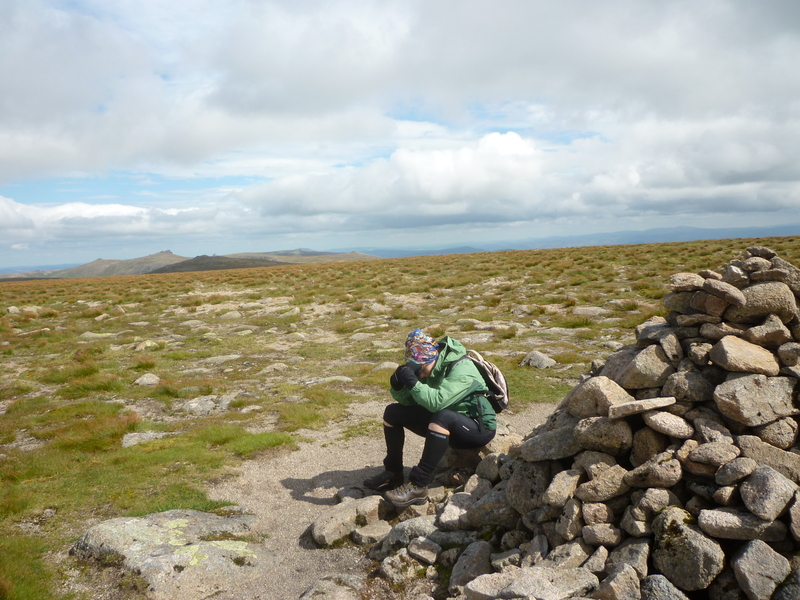 And despite how much of an ordeal this particular munro seemed for us, we’ve been up several together now (I think my current count is 28). 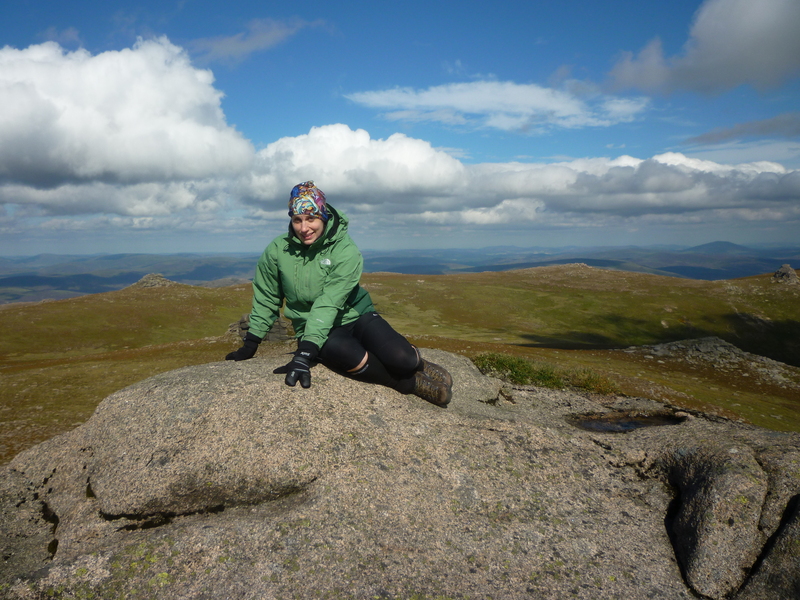 At least we managed some great views at the top, unlike many of our expeditions…. and yours, by the sounds of it!